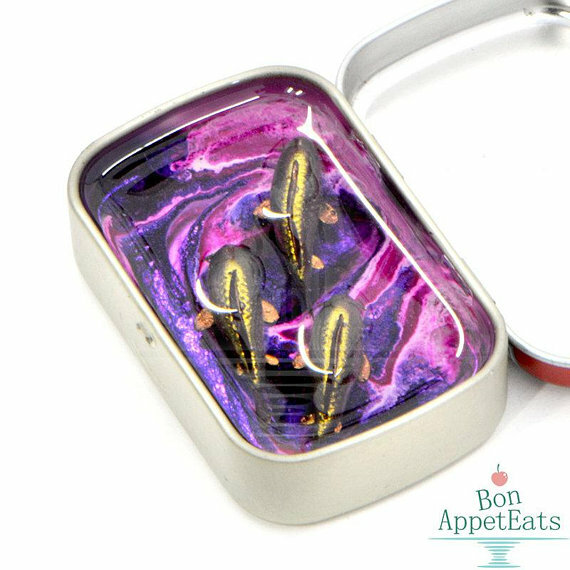 Jackie Chaves of BonAppetEats makes delightful jewelry that looks good enough to eat, but among her best-sellers are these cute miniature ponds inside Altoids Smalls mint tins. Every miniature fish and aquatic animal is hand sculpted out of polymer clay, one by one, without the use of any molds. Each container is decorated by hand and then filled with an epoxy resin to simulate water. I do take commissions for these miniature ponds when my commissions are open. Just convo me to see what containers I have available at the time. :) I also offer them in Altoids Tins, stone ponds, or other cups and containers! These are also a great memorial gift for those whose little aquatic buddies have passed on. Check out more delights at her Etsy shop.